IN HONOUR OF FIRST PRIZES BAD!SLAM!NO!BISCUIT! RETURNS TO NOTED FOR THE FIRST LAST AND ALL TIME TO GIVE YOU A MICROPHONE FOR TWO MINUTES WITH NO PROPS NO MUSIC AND YOUR ORIGINAL MATERIAL FOR GLORIOUS FIRST PRIZES. That’s right→BAD!SLAM!NO!BISCUIT! is the nation’s Australian Capital Territory Poetry Slam and it wants you on stage in the audience at the bar! For poetry; Or something else! And to that end we provide you a stage, microphones, sound, audience, poets, bar, toilets, MCs, lights, The Score Adder, coasters, The Master of Conflict and doorways. And because that isn’t enough we have feature acts! So many feature acts! Including the resplendent David Stavanger, the (in)famous Tessa Rose, the triumphanti̶n̶e̶ Beige Browne, and the Fanciful Fiction Auxiliary! As well as the mystery we are keeping mysterious. BAD!SLAM!NO!BISCUIT!, it wants your words with you in the Phoenix Pub. The FFA has appeared at Woodford Folk Festival, Bad!Slam!No!Memoir!, the Brisbane Fringe Festival, and the Queensland Poetry Festival. Tessa Rose is a poet and performance artist. She has performed at Brisbane Square Library, Ruckus Slam, The National Folk Festival, and Woodford Folk Festival. She performs avant-Jazzercise with Pascalle Burton in 24-Hour Gym, composes Twin Peaks found poetry, and co-produced the Old Museum’s spoken word open mic night, BAD!SLAM!NO!MEMOIR! Beige Brown is Australia’s foremost feminist performance poet. Her permutative sound poetry introduces productive uncertainty into the phallogentric thrust of mainstream literary culture, fissuring the pompous edifice and causing little word-rivulets to trickle out from many smaller openings. 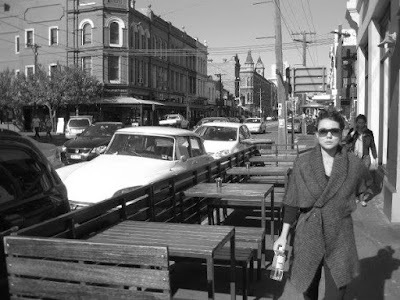 A previous participant at Noted, she has been willfully excluded from other larger literary festivals, yet is highly regarded by the discerning amongst Australia’s literary cognoscenti. And of course there is the mystery we are keeping mysterious! 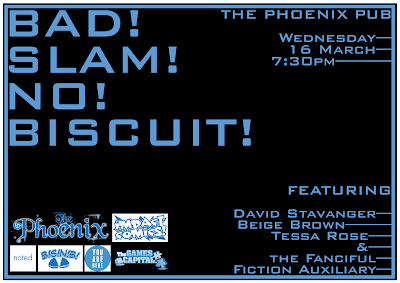 So, remember, join BAD!SLAM!NO!BISCUIT! inside the Phoenix Pub, sign up from 7:30pm, poetry slam from 8pm, 1st prizes! glory! 2 minutes! No music! No props! Your original material (unless you’re a rebel, we welcome rebels)! All inside the Phoenix Pub. All part of Noted. All for your words and teeth.